Long before Batman first appeared in a comic book in 1939, New Yorkers were calling their city Gotham—thanks to Washington Irving, who came up with the moniker in 1807. Gotham is the name of a British village where, legend has it, residents were “wise enough to play the fool.” It was kind of backhanded compliment from Irving regarding how cunning New Yorkers were, even in the 19th century. Just as Gotham, England was the inspiration for New York’s nickname, New York inspired Gotham City. Batman’s hometown is supposedly based on Manhattan below 14th Street. 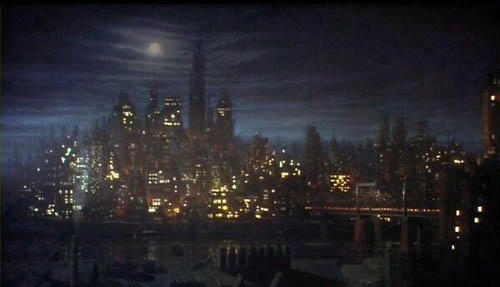 In this still from the 1989 Batman movie, Gotham City’s skyline looks awfully similar to ours. This entry was posted on February 4, 2009 at 5:04 am and is filed under Lower Manhattan, Music, art, theater, Poets and writers. You can follow any responses to this entry through the RSS 2.0 feed. You can leave a response, or trackback from your own site. An island city, bridges and tunnels, a centrally located large park and reservoir, etc. etc. There’s been tons of debate amongst the nerdy set as to whether Gotham is NY or Chicago, and which one Superman’s Metropolis is supposed to represent. It’s been placed in several places along the Eastern seaboard over the years, from DC to Boston to Rhode Island, but it definitely has an NYC flavor. 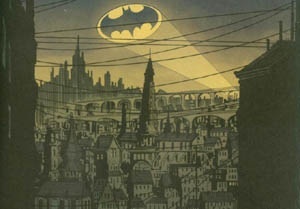 So Batman actually did live in New York City until 1942, when it was changed to Gotham City? Very cool info. And that is some Gotham City map! Very cool. I always wondered the history of that term. Thanks for sharing. For as long as I can remember, Gotham was universally understood as a mythical version of New York. Any association with Chicago is the usual wannabe spin from second-city-ites. So how am i supposed to understand that? Did batman live in NY(just in the movie or comic books called gotham city to sound better) or in totally different imaginary city Gotham which doesn’t really exist? Did anyone notice that in the 1989 version(set in the future), WTC 1&2 are nowhere to be seen?